It’s Sunday evening and my computer screen mirrors my blank stare. That grant proposal that I’ve been meaning to get to has not magically written itself. The coming week is going to be beastly. It would really be best to just finish the proposal tonight. All three email accounts are checked. The dishes are done. The litterbox is clean. Hell, I’m procrastinating so hard that the plants are even watered. Wait! Isn’t there a bouquet of purple basil that was brought by a brunch guest and is still languishing in the fridge? I don’t imagine that rosemary plucked from my dad’s front yard will be good for much longer. 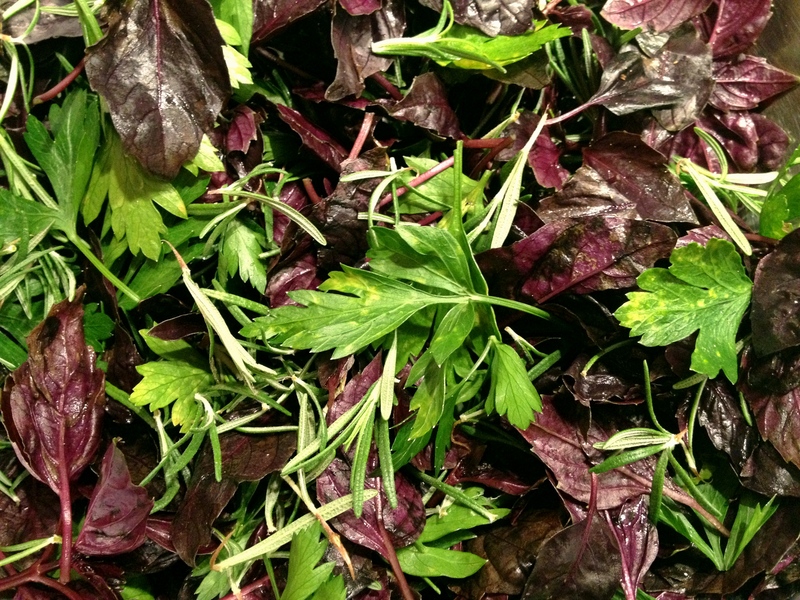 And what of the parsley that arrived in last week’s CSA share? Screw the grant proposal; there’s pesto to be made! Toast a handful of pine nuts, walnuts or whatever else you have on hand in a cast iron skillet over medium low heat. Be sure to watch the nuts closely and stir frequently once they start to brown, as there’s a fine line between toasted and burnt. Rinse and stem your herbs. While basil is traditional, you can make a pesto with just about any herb. I have a particularly fond memory of a cilantro jalapeño and lime pesto that I used to top some grilled pork chops. In this case, I used the aforementioned purple basil, rosemary and parsley. I suspect that it will pair nicely with roast lamb or merguez. Toss your toasted nuts, a clove of garlic or a garlic scape, and the fresh herbs into a food processor and grind until you’ve got a coarse paste. This will likely necessitate scraping down the work bowl a few times. I find that it helps to start by pulsing. If it really won’t get going, just move on to Step 4. It’s all good. While cheese isn’t necessary, it is delicious. Mix in a cup or so of finely grated Parmesan, Romano or other sharp hard cheese. (This is an excellent use for that dried out hunk in the back of your cheese drawer.) If you do not already have one, I highly recommend acquiring a rasp, which is often referred to as a microplane in kitchen supply stores. It will make short work of hard cheese, citrus rind, whole nutmeg and your knuckles. Be careful! With the food processor running, gradually add a stream of extra virgin olive oil until your pesto reaches the desired consistency. I tend to go with less oil, which yields a thicker pesto, assuming that I can always loosen it up later if need be. In this case I used about half a cup of oil. Since you will not be cooking the pesto, this is the time to bust out the good stuff. At this point, you can call it pesto, but I find that a little tweaking helps. The pungency of the herbs, the saltiness of the cheese, and the grassiness of the olive oil will all impact the flavor. So taste it and adjust as you see fit. In this case, I added the zest and juice of one lemon to brighten the woodiness that the rosemary imparted. I added a little more salt and a healthy dose of freshly ground black pepper because I’m into that. Sometimes a pinch of sugar does the trick. Trust your tongue. Pesto freezes brilliantly. I like to spoon it into ice-cube trays, freeze it overnight and then toss these cubes into a plastic baggie so that I can defrost just what I want on a given night. The nights are getting colder and the air has that crisp feeling that signals the end of summer. Soon acorn squash and beets will replace the sweet corn and tomatoes and the notion of an overabundance of fresh herbs will seem laughable. 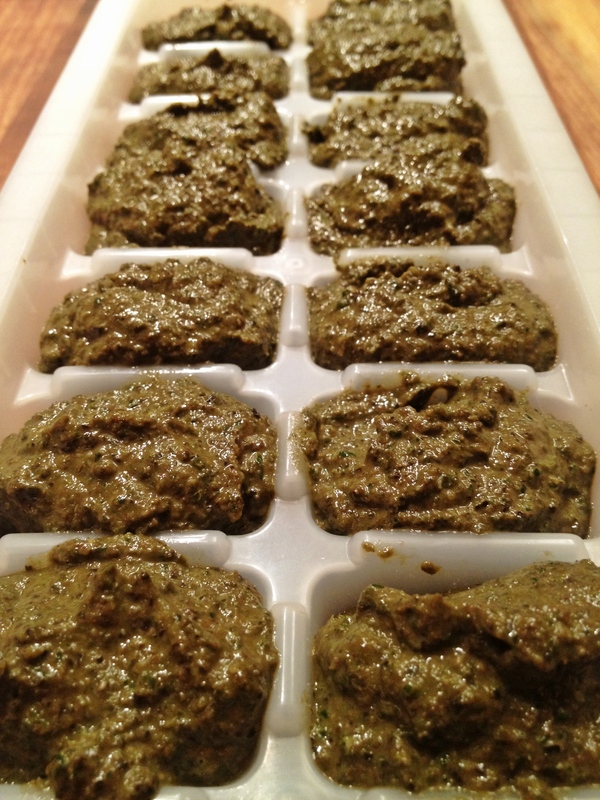 Pesto cubes will be a welcome reminder of summer come January. This entry was posted in vegan, vegetarian and tagged basil, herbs, nuts, pesto, rosemary by Jasmine Nielsen. Bookmark the permalink.